I have many favorite meals that my mom makes best and meatloaf is one of them. I never thought meatloaf was something for one, but I found a recipe that makes them in muffin tins so they are evenly proportioned and has a few options for adding flavors. Once you make these, pop them out of the tins and then freeze for an upcoming lunch, much like Lin’s Little Chicken Pot Pies. Makes 12 mini meatloaves with a suggestion of two per serving. Even with freezing, six meals is like meatloaf mania for this single girl so I use 1/2 pound or less of meat, bread crumbs in lieu of stuffing and less water (obviously). You can change this up and use chili powder, salsa and cheddar cheese OR garlic powder, BBQ sauce and cheddar cheese. Hope you’re enjoying frozen food week and look forward to new recipes and ideas to celebrate our March Madness of Lunch Packing! By the way, what did you pack today? These look really good. I think the sauce and cheese are good way to dress the meatloaf. Hope to see them at lunch one day. I have to share. I can’t remember the recipe I used, but I had great fun with it. I took these “muffins” to a craft party all frosted with mashed potatoes. We decorated them with ketchup “gel” frosting. They even fooled the 3-year-old in attendance. She was very confused. those are so cute! I’m infatuated with the book, Hello, Cupcake! like spaghetti and meatballs and the TV dinner. 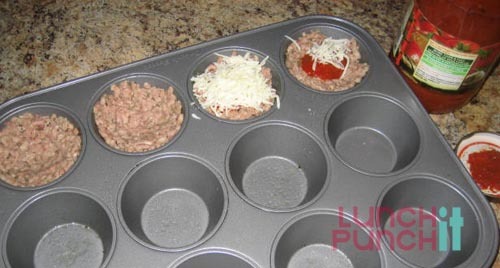 Making meatloaf in muffin pans is my favorite way to force portion control. We are big meatloaf fans and it usually disappears much too quickly. When people think portion control they almost always think calories, but it is good for making a meal fit its suggested serving size. Those of us who grew up with or are still living with Depression era cooks, know a little about making your money work best.